The Central Park Zoo. In 1934, the original Central Park Menagerie, which was just wooden sheds and some cages, was torn down and replaced by nine brick and concrete buildings and with landscaping and seal pool, designed by CWA-paid Parks Department architects   [10,p.352] , the materials paid for by the CWA [2,pp.383-385], and the labor also. The Zoo was renovated in the 1980s; this page shows the the original parts that still remain, including two buildings and the Dancing Goat and Dancing Bear statues by Frederick Roth, plus numerous friezes. Central Park Zoo Opening Day, December 2, 1934. Photo: [1,p.450]. 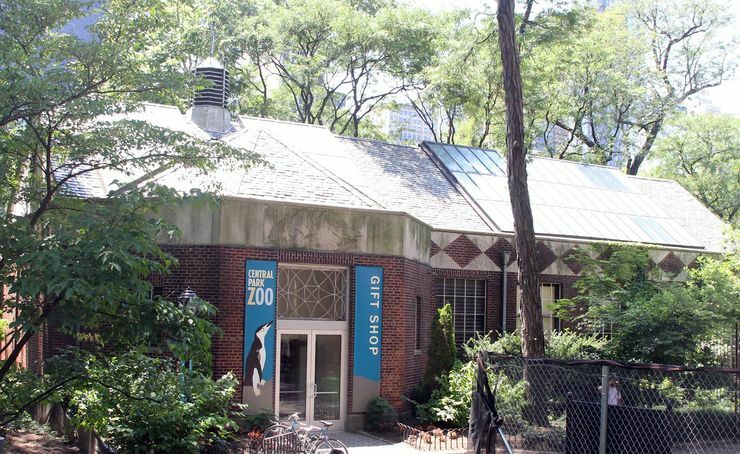 The Gift Shop, pictured above, is one of the few 1934 buildings that survives after the entire zoo was rebuilt in 1988. This was the design of all the buildings: brick topped by a limestone frieze showing what to find inside the building (in this case birds — click the Enlarge button to see), with a slate roof and an ornate chimney. Rosenzweig, Roy, and Elizabeth Blackmar, The Park and the People: A History of Central Park, Cornell University Press (1992) [website]. Caro, Robert A., The Power Broker - Robert Moses and the Fall of New York, Vintage Books (1974). History of Central Park Zoos, Parks Department Website (accessed 5 March 2018): "The new brick and limestone "picture-book zoo" was designed in just 16 days by an in-house design team headed by Aymar Embury II. Construction on the roughly six-acre zoo took only eight months, helped along by federally financed Works Progress Administration (WPA) labor." Centralpark.org: "In 1934 Parks Commissioner Robert Moses used Works Progress Administration (WPA) funds to construct what was, for its time, a state-of-the-art facility." Central Park Zoo at the NYC Parks Department website, gallery of pictures and some information. WPA Does Its Bit to Make Central Park a Hodgepodge, Chicago Daily Tribune, March 21, 1939, p.10. Aymar Embury, Wikepedia. He was the chief or consulting architect for the Central Park and Prospect Zoos, the Prospect Park Bandshell, the Corona Park Pool and Bathhouse (and three others), the New York Pavilion at the 1939 World's Fair (now the Queens Museum of Art) and the Argentine Pavilion, the Triborough Bridge, the Bronx-Whitestone Bridge, the Henry Hudson Bridge, the Little Hell Gate Bridge, Orchard Beach, Bryant Park, the Hofstra University campus, Jacob Riis Park, and nobody even knows how many more New Deal projects. Aymar Embury II Papers, Syracuse University. Frederick Roth, Wikipedia ["From 1934 to 1936, he worked under the Works Projects Administration as the head sculptor for the New York City Department of Parks and Recreation"]. 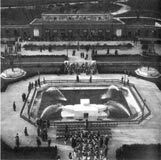 New York City Parks Department press release of November 28, 1934, announcing the opening of the Central Park Zoo "designed by Aymar Embury, II, with the assistance of the staff of architects of the Park Department. It is simple, masonry construction. The exterior walls are of brick and all of the interior walls are buff tile. The sculptured friezes by F. G. Roth are excellent. Mr. Roth and the sculptors who assisted him carved these figures of animals into the limestone by hand and did not follow the usual practice of furnishing a clay model to stone carvers, who actually work on the scaffolds." CWA funding and labor are not mentioned, but chairmen of TERA and the NY Department of Public Welfare were among the speakers. Federal Writers' Project, The WPA Guide to New York City, Random House (1939), p.352. The 1934 Zoo at cpzbook.com (gallery).